Separated from carriage traffic: a protected bicycle sidepath in Monroe County, N.Y.
Last week I wrote that California was already recommending protected bike lanes, rather than painted ones, in 1972. 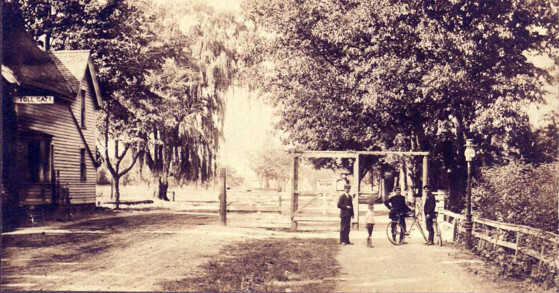 But did you know that there was an American protected bike lane movement in 1905? It started in 1898, right at the end of the 1890s “bike boom” that began with the pneumatic tire and ended with the Oldsmobile. But it was different than the “Good Roads” movement you might have heard of, in which bikers allied with farmers to create paved shared routes through the countryside. Before most roads were widened and paved, and before cities required (or assessed) abutters to install concrete sidewalks and curbing, advocates took advantage of the transitional state of the built environment to insert sidepaths into the urban landscape. The proposed paths “shall not be less than three feet or more than six feet wide … and shall be constructed within the outside lines and along and upon either side of such public roads and streets.” While they were to be built within the already-established legal right of way, the sidepaths were segregated from both the adjoining road and from sidewalks: already-existing pedestrian paths were not to be subsumed or inconvenienced. Later court decisions made it clear that wagons, carts, and horses were excluded from the paths. They were to be a separate network, set apart from foot and vehicle traffic, solely for bicycles. They were, in short, protected bike lanes. The basic problem for sidepaths, Longhurst shows, is that after an initial burst of enthusiasm among bike advocates faded, there wasn’t enough public money in place to build and maintain them. Charitable fundraising dropped off. Governments resisted taxing the public at large for what was seen as a service for urban elites. User fees, funded by bike licenses, were supported by some bikers but not others. Where sidepaths were hobbled from the start by a weak and fluctuating funding stream, [historian Christopher] Wells observes that the interstate highway system was successful because of the ingenuity and invisibility of its financing, hiding the cost from end users and protecting it from the depredations of marauding legislators. When it comes to infrastructure, it seems, the funding mechanism is destiny. Ocean Parkway, Brooklyn, in 1894. Photo: nycgovparks.org. If the paths themselves had continued to exist, they might have offered alternative suburban and interurban commuting options throughout the twentieth century. As cities and towns of America expanded, the suburbs would have bloomed along the sidepath networks linking them back to the urban center. 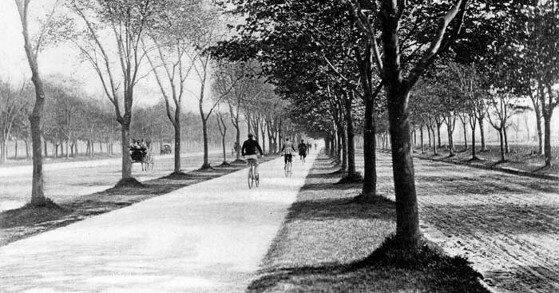 The persistence of sidepaths might have provided some American cities with a built-in radial network of bicycle paths throughout the twentieth century — the very network that many are now trying to build or accommodate, with great difficulty, in the twenty-first. 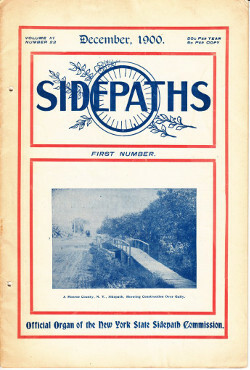 Top image and magazine cover: “Sidepaths. Monroe County,” scrapbook dated 1899, Central Library of Rochester and Monroe County, Historic Monographs Collection, Rochester, NY.